You know you've found the one you need to spend the rest of your life with when you can laugh through everything life throws at you. 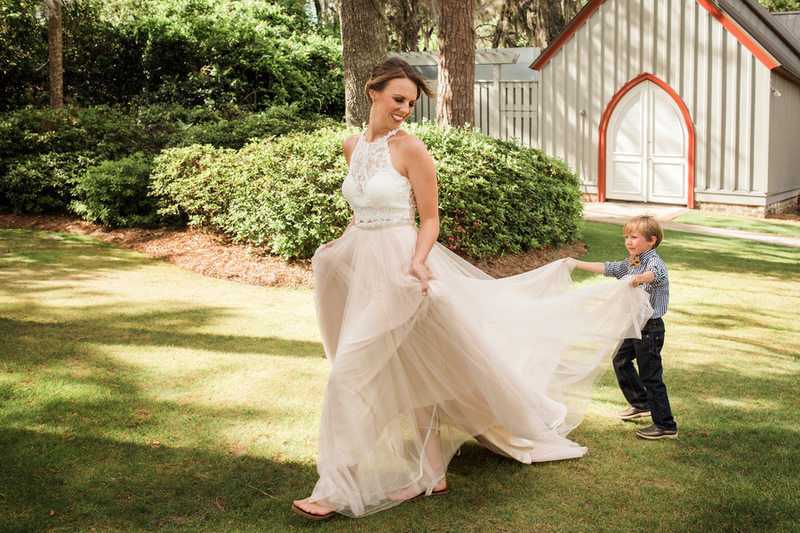 For Nikki and Colin, their wedding at a family friend's house in Bluffton, South Carolina, was filled with happiness and laughter from start to finish: it might have been small, but it was anything but subdued, much to the pleasure of the couple and their guests. The talented team at Cariad Photography worked with the couple to showcase all of the carefully chosen details throughout their special day. 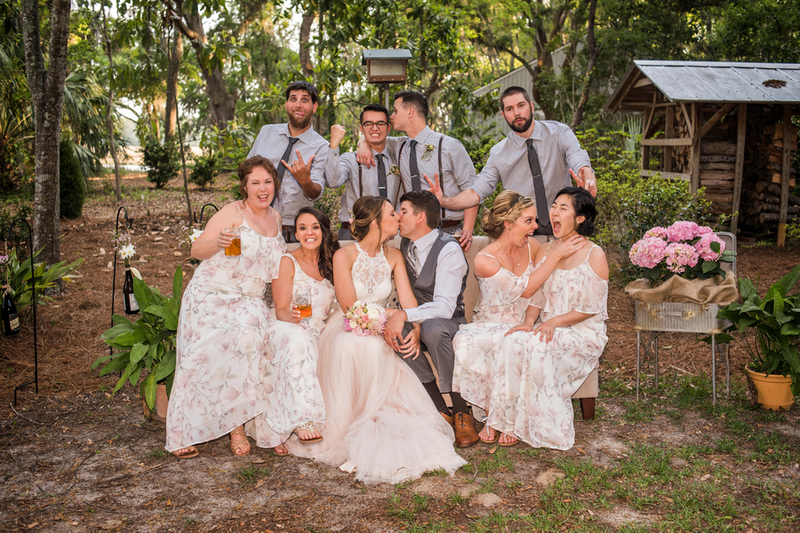 As they planned their wedding, Nikki and Colin knew they wanted a celebration for their family and friends that was casual, personal, and uniquely reflective of their relationship. 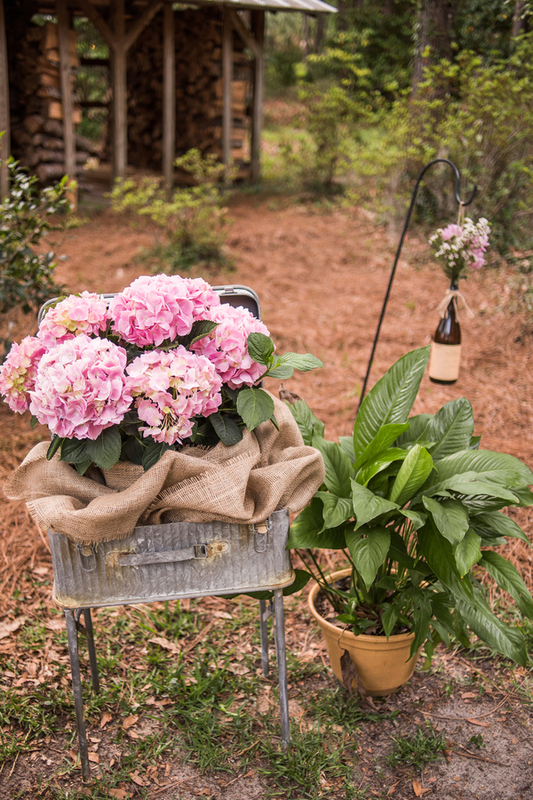 They settled on Bluffton, a quaint town near Hilton Head, since it was where the groom had gone to high school and where his parents still call home. 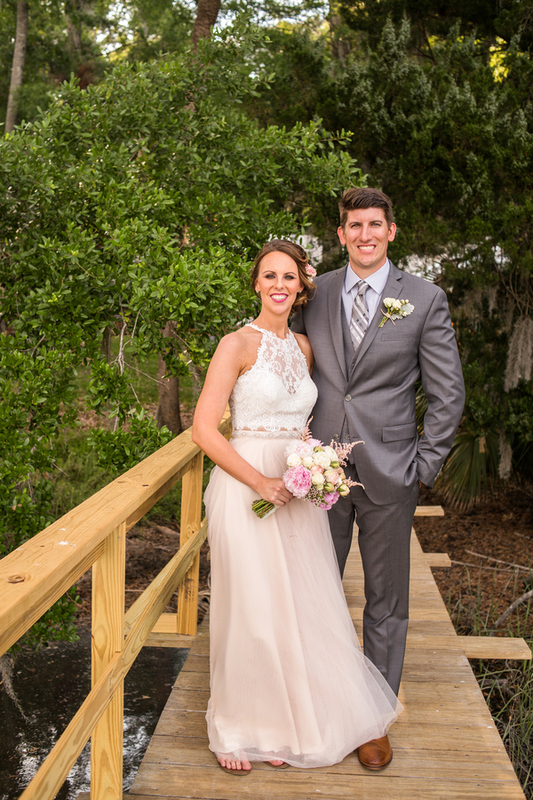 The laidback, hometown feel of Bluffton coupled with the coastal charm of the area sold Nikki and Colin on the area as the perfect wedding locale. 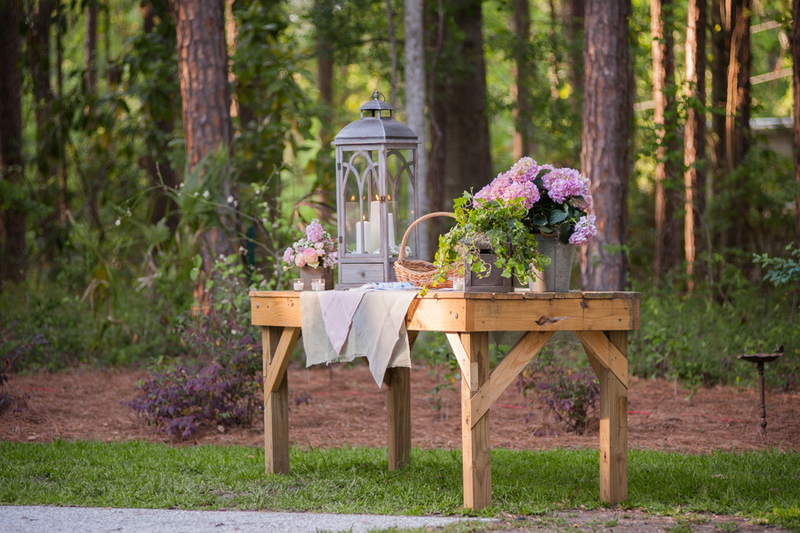 Their wish for an upbeat and rustic event was executed perfectly with their chosen vendor team, and they gathered among their guests for a beautiful Lowcountry wedding. 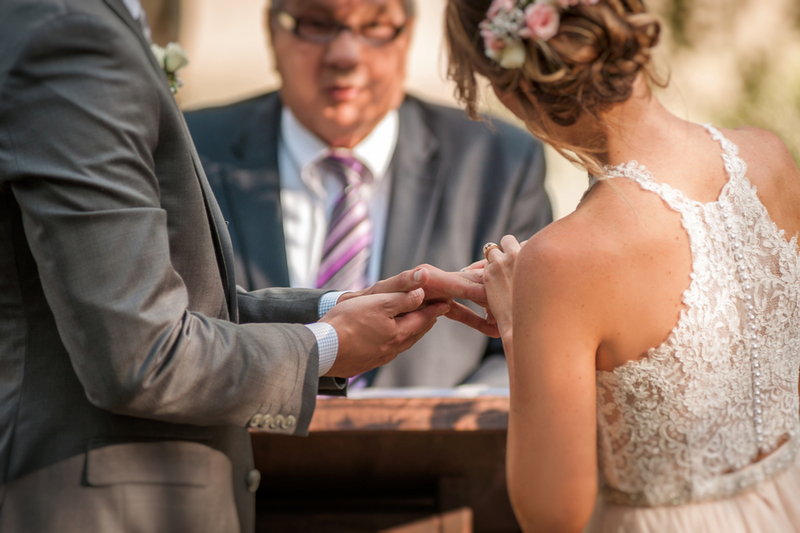 The couple opted for a first look in the garden of the nearby Church of the Cross, where the bridal party and the couple laughed their way through their photographs, keeping up the lighthearted feel that permeated every moment of this joyous day. 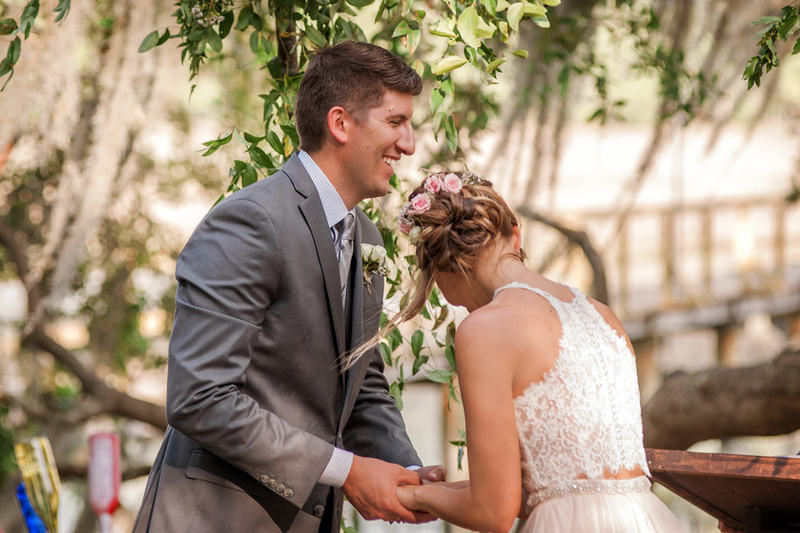 Groom Colin's favorite parts of the day included the first look and seeing how happy his new bride was throughout the day (so sweet!). 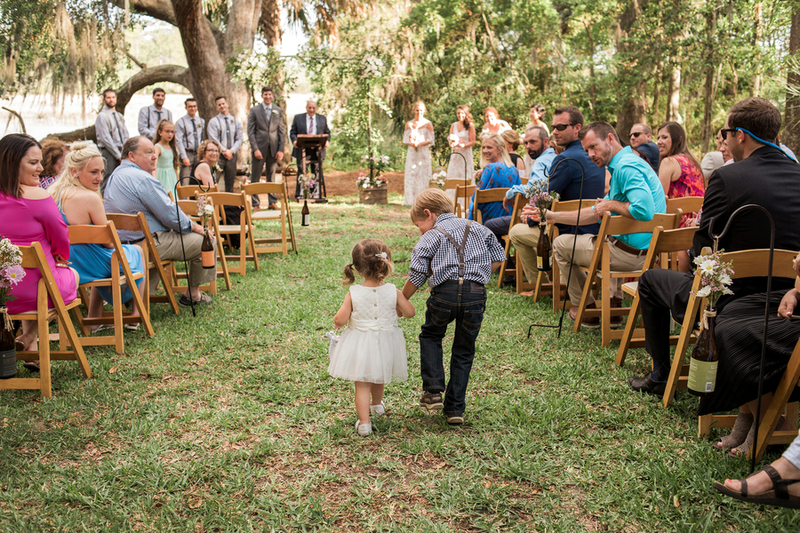 They then exchanged vows under the Spanish moss laden trees of their friend's backyard in a picture perfect ceremony. 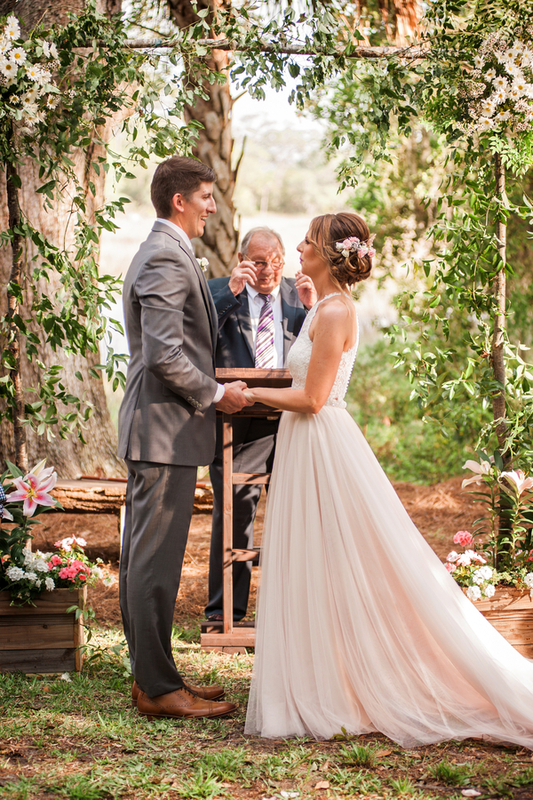 "Saying my vows was my favorite part of the day," recalls bride Nikki. 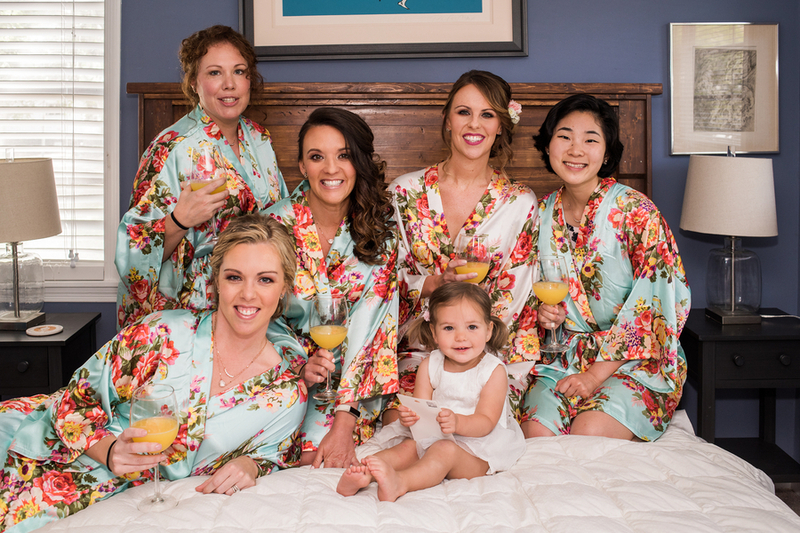 "We were so relaxed and all of our family and friends were there to share in our commitment to each other." 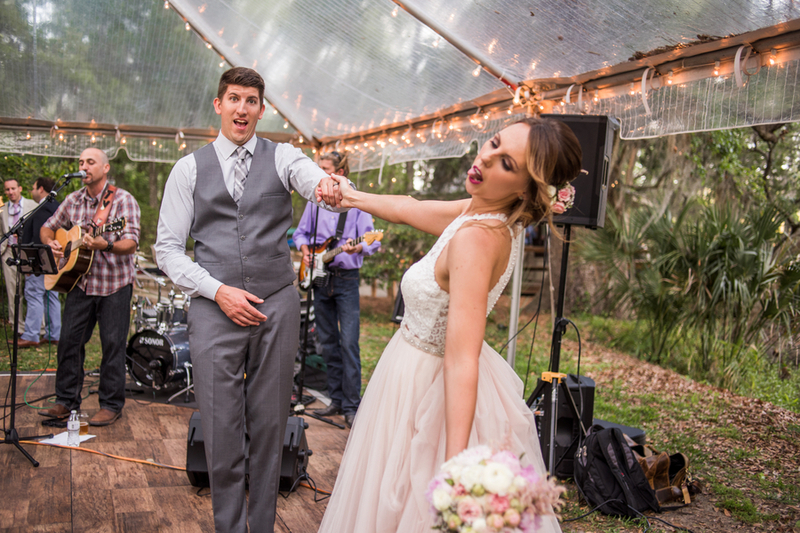 After the bride and groom led their guests into the reception area, the party began! 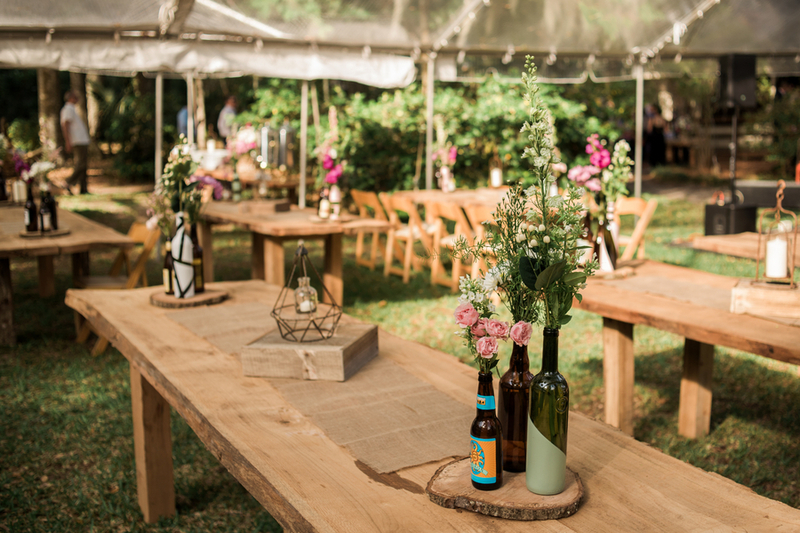 The couple's love of craft beer showed up in the reception decor, as the centerpieces on each of the tables were bottles that the couple had collected throughout their relationship. They also served up their favorite brews in custom beer glasses designed by a friend. One other fun detail about their custom glasses was that the design was inspired by the couple's favorite song, "Drunk on Your Love" by Brett Eldridge. As the afternoon faded into the evening, the guests ate, drank, and danced merrily with the new couple. The bride and groom's favorite local band, Night Train, provided the music for the lively affair and had everyone out on the dance floor. 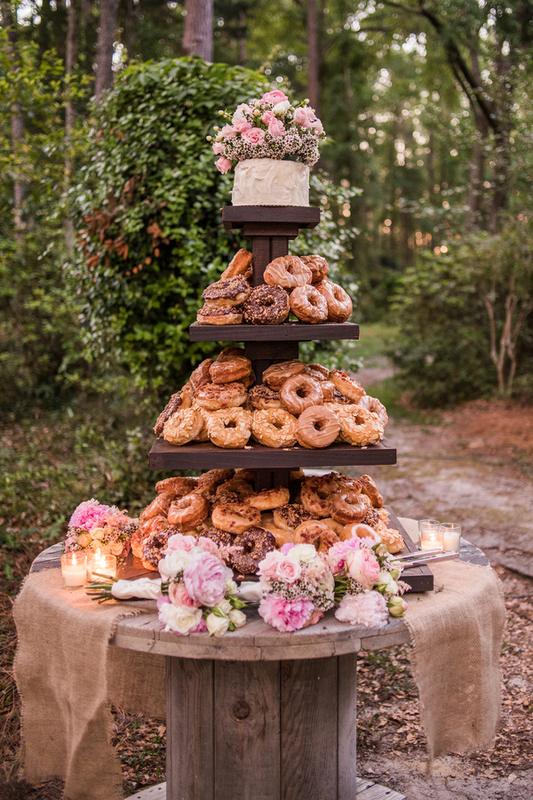 Nikki and Colin had opted for a stunning dessert centerpiece made up of stacked doughnuts topped with a carrot cake, which was a unique creation that the guests adored. When it was time for the couple to leave the reception, they went through the sparkler line...five times! "We wished the night lasted forever!" says bride Nikki.